Eating right and staying physically fit are important no matter your age. Aging bodies have different needs, and certain nutrients become especially important for good health. Some of the most important vitamins, minerals, and nutrients are listed below. Older adults need more calcium and vitamin D to help maintain bone health. Seniors should consume three servings of calcium-rich foods each day. Sources of calcium include fortified cereals and fruit juices, dark green leafy vegetables, canned fish (such as sardines or kippers) with soft bones, milk and fortified plant beverages. A multivitamin that contains vitamin D is also recommended. Many people over age 50 do not get enough vitamin B12. Cereals, lean meat and some fish and seafood provide adequate levels of vitamin B12. Older adults should seek the advice of a doctor or dietician to see if a vitamin B12 supplement is recommended. Fiber-rich foods help bodies digestive systems stay regular. Fiber also can help reduce risk of heart disease and help prevent Type 2 diabetes. Whole-grain breads and cereals, beans, peas, and fruits and vegetables often provide enough fiber, but a supplement or fiber-rich beverage may also be recommended for some seniors. Increasing potassium along with reducing sodium (salt) may lower the risk of high blood pressure. Fruits, vegetables and beans are good sources of potassium. Choose and prepare foods with little or no added salt, and instead add flavor to food with herbs and spices. The menu at our Courtside Café includes daily specials, a la carte items, and a salad bar, as well as drinks and desserts. 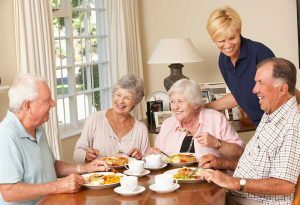 At Knights of Pythias Retirement Center we offer choices to enhance your lifestyle and support your independence. We hope you enjoy visiting our café and that you make it a part of your daily living experience in our community!